SOFT PLASTICS → Trailers → Xcite 4" Raptor Tail Jr.
Xcite 4" Raptor Tail Jr.
A great choice as a flip bait or a bigger jig trailer, the Xcite Baits Raptor Tail™ Jr. offers more size and vibration than its slightly smaller cousin the Raptor Tail™ Chunk. Its 4" size makes it very versatile, and its high floating action means it will always rise in a defensive position on the pause. 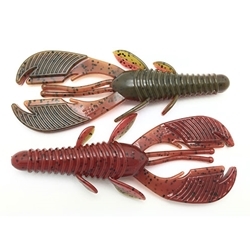 Its specially designed claws give it a tremendous lifelike action, and each bait is infused with Xcite Attractant for added fish attraction. Comes 6 to a bag.